My goal was to tell the Naomi-Ruth-Boaz story in song, staying consistent with the Bible. “Naomi” means pleasant and “Mara” means bitter. In the song Nice Enough Girls Naomi sings about a wedding that would last a week or two and involve a lot of celebration and the word “drink” appears twice – this is a little personal nod to Jesus turning water into wine at a wedding in Cana because that traditional Jewish celebration had run out of wine. I’m afraid Elimelech is treated the worst; in I Am Bitter, Naomi sings “Elimelech was no great husband.” This is an extrapolation from the text: not every family had to leave Bethlehem during the famine and Naomi probably wasn’t thrilled to migrate. In the big picture this is all part of God’s grand design but for a widow in a foreign land it’s hard to see beyond the immediate need to keep body and soul together. I also think it’s consistent with Naomi’s rejection of her “pleasant” name – she is feeling bitter and disappointed and it would be only human for some of those feelings to get projected onto Elimelech. Major kudos to Buzz for tackling a thankless role. It’s very hard for me, as a 21st century American, to relate to “levirate marriage” where the brother of the deceased husband marries the childless widow in order to raise children in on behalf of his brother. To generalize, women historically had two life paths available to them: to marry and raise children or to be a harlot. In a time without Social Security or welfare benefits, widows and orphans were especially vulnerable but a widow with a son had an advantage – they could glean enough to survive and as an adult he would care for his mother. Deuteronomy 25 gives the law to Israel that insured God’s people would not be dishonored by neglecting their widows. If a brother refused to take his brother’s widow, she would take him to the elders (and court of public opinion) and make her claim against him; if he continued to refuse, she would remove his sandal in their presence and spit in his face. Happily this doesn’t happen in the book of Ruth: these are near kinsman but not Mahlon’s brothers. Boaz is clearly interested in redeeming the land and marrying Ruth whereas the nearer kinsman, for whatever reason, is only interested in redeeming the land and chooses to back out of the deal when he realizes he will be required to marry the Moabite widow. In this instance the go’el, the nearest living male relative (the Nearer Kinsman, in our presentation), removed his own sandal in front of the witnesses as evidence that he refused the responsibility; this action freed Boaz to marry Ruth. Why was Boaz amenable to marry Ruth when the 'nearer kinsman' was not? 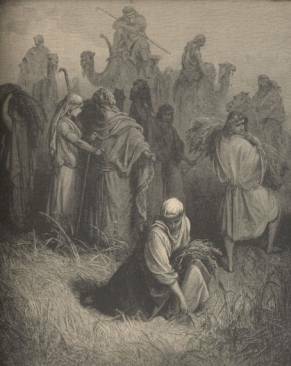 God specified the laws of gleaning in order to provide for widows and orphans. With no welfare or social security, the family and the community were the only safety net. When you reap your harvest in your field and have forgotten a sheaf in the field, you shall not go back to get it; it shall be for the alien, for the orphan, and for the widow, in order that the LORD your God may bless you in all the work of your hands. (Deuteronomy 24:19). It is no coincidence that Bethlehem, the “house of bread,” is the setting for this tale as well as the birthplace of Jesus. Some Christians may not understand the association between Ruth and Bethlehem, but David is associated with Bethlehem on account of Ruth and Boaz, his great-grandparents. Throughout the Hebrew scriptures “the city of David” refers to the (biblical) city of Jerusalem which David captured from the Jebusites and established as the seat of Israel’s government over 3,000 years ago, but Bethlehem was his hometown and in 1 Samuel 20:6, David himself refers to Bethlehem as his city; it is only about 5 miles from Jerusalem. The gospel of Luke refers to “the city of David” and means Bethlehem, the birthplace of David to which Joseph brings Mary, great with child, to register for the census. Bethlehem is first mentioned in Genesis 35:19 as the burial place of Rachel, Jacob’s beloved wife and mother of Joseph and Benjamin. In Micah 5:2 the LORD says to the prophet: “But thou, Bethlehem Ephrathah, which art little to be among the thousands of Judah, out of thee shall one come forth unto Me that is to be ruler in Israel; whose goings forth are from of old, from ancient days” (from the Tanakh by way of the Jewish Virtual Library, Micah 5:1 as the chapter break is different).